The Flavor Infusion technology traps the steam inside the pressure cooker and forces all the liquid into the food. This infusion technology leaves you with food that is full of moisture and intense flavors. It also keeps the nutrients you need intact. The high pressure from this cooker is good for cooking a variety of different food items including meats, fish, veggies, beans, soups, and stewsjust to name a handful of things. The Pressure Cooker also claims to be able to save you time because it allows you to throw all the ingredients right into the pot. You don't even have to defrost anything before throwing it in. It also features a one-touch preset operation which allows you to turn the pressure cooker on, choose the ideal setting, and walk away. No need to worry about it until it's done. It is one of the most convenient and versatile kitchen appliances you can purchase. Finally, it also helps to keep your kitchen much cooler than if you were to use the stove which is great for those hot summer days when you would rather not heat the house while making dinner. After throwing your ingredients into the pressure cooker, it will take up to twenty minutes for the appliance to come to pressure and begin cooking the food. So, when you are adding up the time it will take for prepping and cooking, don't forget to include the time it takes to pressurize. Always make sure the steam valve is set in the right position as well and steer clear of it when you release the steam after cooking. The valve is designed to quickly release all the steam that was contained in the pressure cooker. If you accidentally touch it or have your face over it when it releases, it can end in disaster. While this pressure cooker sounds like a time saver, some customers have found a few drawbacks. One of the biggest complaints was the poor customer service that the company offered. Their representatives couldn't answer questions and customers experienced long hold times. Others have submitted complaints regarding the overall quality of the pressure cooker. Some say that the appropriate temperature couldn't be maintained and therefore ends up burning the food. Others complained that the timer wasn't working properly. Another complaint had to do with the safety features. For example, the steam release valve felt loose on some models and didn't stay in position. If you haven’t looked at pressure cookers recently, the 6-Quart Power Pressure Cooker XL Flavor Infusion technology may surprise you. Electric pressure cookers are sleek and multifunctional compared to their stovetop predecessors. Very reasonably priced at around $100 (see lowest price). The 6-Quart Power Pressure Cooker XL Flavor Infusion is an attractive appliance with a stainless steel housing that is warranted for one-year. The digital timer on the front of the cooker is easy to read. The non-stick Teflon inner cooking pot has a 6-quart capacity and is dishwasher safe. The safe-lock lid has a sturdy handle and a manual steam release. There are many advantages to using the 6-Quart Power Pressure Cooker XL Flavor Infusion Technology. You can cook dinner in one pot. This makes clean-up easier and cooking more energy efficient. Cook time is tremendously reduced, so you spend less time in the kitchen. You can set the timer, so the pressure cooker turns on when you are at work. And because the Power Pressure Cooker makes even tough cuts of meat tender and succulent, you can save money on groceries. The Power Pressure Cooker advertises a flavor infusion technology that “locks in nutrients and vitamins,” “ infuses flavor” and “keeps fiber intact. Tristar, the New Jersey-based company that distributes The 6-quart Power Pressure Cooker XL Flavor Infusion technology, widely advertises the product on television. It offers a reasonable purchase price for the 6-Quart Power Pressure Cooker XL Flavor Infusion Technology, a payment plan and a 60-day money back guarantee. The best thing about this pressure cooker is the veggies. I have never eaten so many vegetables because they cook perfectly in just a matter of minutes. I am very pleased with my purchase. ​I bought my Power Pressure Cooker XL after watching an infomercial on television, but I regretted the purchase immediately. I figured I had made a stupid impulse buy and I was already planning on how to return it and get my money back. But when the pressure cooker arrived, I read the directions carefully and decided it was worth a try. I seasoned the pot and followed the directions for the pot roast. I was amazed and pleased! It was my first time cooking in a pressure cooker, ever, and it was really good! I can cook ox tails and ribs in just about an hour, and they taste delicious. I know I got my money’s worth here. I especially like all the recipes and cooking demonstrations on YouTube. The "Flavor Infusion Technology" really makes my food taste great. Although most of the customers who purchased this product gave it favorable reviews, there are some concerning red flags. The Power Pressure Cooker is not ETL approved, which is the industry standard for product safety. Make sure to check out other reviews before making your final decision. There is concern about the Teflon material used in the no-stick cooking pot. Teflon, also known as perfluorinated chemicals, is considered toxic to humans and dangerous to the environment. The U.S. government phased out the use of Teflon in 2015 due to health concerns. Another area of contention is the Flavor Infusion technology. There is no evidence to support that this product is inherently different from other pressure cookers. The benefits of the Power Pressure Cooker are benefits shared by other pressure cookers. The canning function of the power pressure cooker is not supported by the Food and Drug Administration. “USDA does not have recommended processes for canning in a small pressure cooker. The recommendation for using USDA pressure processes for low-acid foods is to use a canner that holds at least four (4) quart-size jars. Finally, there is concern about the Tristar Company itself. One thousand complaints were filed against the company with the Better Business Bureau in the past three years. More than half of the complaints had to do with the product or service. The Power Pressure Cooker also offers several helpful modes. You can give away your slow cooker because the Power Pressure Cooker has a slower cooker option. You can still make your favorite slow cooker recipes, but now they will be ready ten times faster. The Power Pressure Cooker also has a warming mode. You can keep food at the perfect temperature for those who can’t make it to the table on time. Although the 6-quart Power Pressure Cooker XL Flavor Infusion has a tremendous advertising platform, the product seems lacking in several critical areas including safety features and customer service and satisfaction. There are other products available at comparable prices that have received a higher evaluation. This is not a product that I would select for the top 10 pressure cooker list. I asked for the power pressure cooker for Christmas and I’ve been so frustrated to find recipes? I did not get any books….didn’t this package “as seen on TV” come with recipes books? I’ve tried to youtube but no success on finding out how to steam vegetables. The website at powerpressurecooker.com/recipes only has limited recipes and 75% of them I don’t like. Please help! I really want to enjoy this cooker but so frustrated I’ve wasted so much time. A recipe book and instruction book on steaming vegetables, etc… would’ve been very helpful! I am not sure, did you try contacting the company? I am trying to see, find if there is a stainless steal iner pot for the 6 quart… I am sure that I saw there was when I first looked into buying the one I have…. I purchased this pot about 6 months ago. I’ve been so disappointed with the inner pot that I’ve only used it 5 times. After I seasoned the pot and used it for the first time, the meat burned on the bottom. It took so much work, even after soaking, to removed the burned material that it was a long time before I tried it again. Again it burned. I’m beginning to think that there is a “hot spot” in the coil that heats the bottom that is flawed. I’ve tried several different foods and each one has burned. Now I’ve had to scrub so hard to remove the burned food that the thin layer of “Teflon” is gone in some spots. No I didn’t use an abrasive material on it, just soaked it and scrubbed hard. The pebbles on the bottom make it almost impossible to clean if something burns on. Would I purchase this pot again – probably not, especially if changes were not made on the inner pot. Will probably be ordering another pot, different brand, because I do like the convenience of pressure cooking. Have they got a time chart that food takes to cook ? There are tons of video recipes on youtube. You can also use the recipes from Instantpot, just adjust the time if you need to. Hi again, Jim! I agree, there are LOTS of video recipes on youtube — as well as great recipes just all over the web. I don’t limit myself to JUST pressure-cooker recipes, but do a lot of recipe conversions from regular cooking methods to Instant Pot… it’s faster overall and the clean-up is so easy. Thanks for commenting! Hi, Jim! I can’t find the dimensions of the PPCXLO for comparison but I *can* tell you the dimensions for an Instant Pot (IP-LUX60–the 6-quart model): 6.3 (height) x 8.66 (inner pot from side to side). And the smaller 3-quart Instant Pot DUO Mini is 5 inches tall by 7.125 (7 and 1/8, in user-friendly terms) from inner side to side. There is a bit of a metal “lip” on the Instant Pot stainless steel pots that allows the unit to pressure-lock securely with the plastic sealing ring, so I would be super-surprised if another inner pot would fit your PPCXLO. 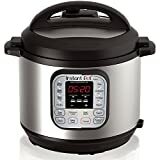 Here’s my thought: If you are thinking about getting an Instant Pot, I can definitely vouch for their ease of use and that the stainless steel inner pot is so easy to keep clean. Even when I’ve had something that’s kind of stuck on (which honestly, doesn’t happen much — and I’m being totally honest). It’s really easy to clean. I haven’t had to use abrasive cleaners or anything. Just scrub a little with my scrub-friendly washrag and regular dishwashing soap. Sometimes I will let the pot sit overnight with soapy water to loosen things. But otherwise, I love the Instant Pot for a lot of reasons! Love my co pressure cooking but now the meat I beginning to scorch I have plenty of water what am I doing wrong help I have recommended it to friends who love it. I need a gasket for a Power Pressure XL 10 quart . How do I order one. I need to know what is the INNER POT made of? Stainless Steel ? Aluminum ? Iron? According to the manual, the inner pot is aluminum and the outer unit is stainless. And I just checked the Power Pressure Cooker XL on my pantry shelf and, sure enough, the outer unit is stainless (a magnet sticks to it) and the inner pot is aluminum (a magnet doesn’t stick). The PPC-XL has a non-stick coating on the inner pot. Some people love it, some people don’t. I think it’s just personal preference. Item as a gift. It cooks well but I have not been able to satisfactorily been able to clean the inner pot since it’s first use. Even with following all the directions, food often sticks and burns on the bottom. The plastic seal picked up the smell of the second thing I cooked in it despite using various methods to eliminate it. When I contacted the company regarding this, feeling that it was a design flaw and requesting a replacement, they told me I could buy a New one and no suggestion on how to get rid of odor. Why buy a New one if the problem will continue to reoocur. Not recommended, Stops working while cooking. I received for Christmas and loved it so much, I gave away my pressure cooker, rice cooker and crock pot. Well, it lasted 3 months and began to have serious problems. It shuts off while cooking, you have to unplug it for 30 minutes to get it to start again – and THEN it stops again when it gets to a certain temp. Customer service is useless, they requested that I send unit to them in original packaging, original receipt AND a check for $24.99. They will then repair or replace. Wow way to stand behind product!